Useful for outreach volunteers or anyone teaching astronomy. All figures are approximate and designed with the NYC public in mind, in terms of analogies and units. Please add as many things as you like. Rutherfurd Observatory was named for Lewis Morris Rutherfurd, a wealthy lawyer who was an amateur astronomer and one of the first astrophotographers (a rather expensive hobby in the mid-nineteenth century). His observatory was initially in the Stuyvesant estate on the Lower East Side, but he became associated with Columbia University (then around Rockefeller Center) as he and natural philosophers at Columbia shared a common interest in astronomical spectroscopy. 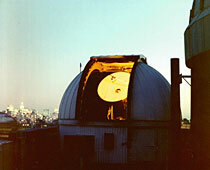 From 1906, approximately two decades before Pupin was built, telescopes were kept in the Wilde Observatory's dome and "transit building" where the Interdisciplinary Science Building now stands (an area formerly known as "The Grove"; see picture here: http://www.wikicu.com/File:WildeObservatory.png ). Transit observations were considered one of the most important aspects of astronomy even into the twentieth century for both time-keeping and navigation (Naval Observatories would announce the precise moment the sun crossed the meridian so that ships in the harbor could set their clocks in order to allow for accurate determination of longitude on the high seas). The current observatory still has a "transit room" with a slit oriented precisely north-to-south to aid in such observations. Pupin Physics Laboratory was completed in 1927. Rutherfurd Observatory has been in continuous operation since Pupin was constructed, but in 2009 a new "Northwest Corner Building" was erected next to it, six floors higher than the roof of Pupin and blocking a significant portion of its field of view, and putting out a considerable amount of light, interfering with observations in the remaining sky. Below the Rutherfurd Observatory on the 14th floor was the site of Professor Wallace Eckert's Astronomical Laboratory, in which he constructed the first device to perform general scientific calculations automatically in 1933-34 by connecting IBM punch card tabulating machines together, arguably inventing punch card programming. Eckert's expertise in this computational device was the reason he was appointed as director of the United States Naval Observatory at the beginning of World War II. His Columbia Astronomy Department replacement was refugee from Europe, Martin Schwarzschild (son of Karl Schwarzschild and later chair of the Princeton Astrophysics Department), who himself enlisted in the US Army and was eventually promoted to be an officer in the Army Intelligence Corps. After the war, Eckert returned to Columbia to head the newly-named Watson Scientific Computing Laboratory that worked in close cooperation with IBM. In 1957, Eckert's laboratory finally left Pupin Hall to the new campus at the Thomas J. Watson Research Center in Yorktown, New York, still the headquarters for the IBM research division. Pupin Hall is also where Enrico Fermi, Leo Szilard, and other physicists began work on developing a self-sustaining neutron chain reaction in 1939, in the basement. When Fermi's work moved to the University of Chicago after Pearl Harbor so it would be safer from attack from the sea, it was called the Manhattan Project because of where it had begun, and it kept its name when it moved later to Los Alamos, New Mexico. Here is an article from the NYT describing the Manhattan roots of the Manhattan project: http://www.nytimes.com/2007/10/30/science/30manh.html?pagewanted=1. There are six trillion miles in a light year. The ratio of an astronomical unit to a light year is coincidentally close to that of the ratio of an inch to a mile. Light travels at the speed of one foot per nanosecond.